THE Virgin Labfest, a festival of new plays (untried, untested, unpublished and unstaged) by emerging and well-known playwrights, directors and actors will be held from June 29 to July 10, 2011 at the Cultural Center of the Philippines’ Tanghalang Huseng Batute (Studio Theater) and Bulwagang Amado Hernandez (Conference Room). The event is a joint venture of CCP, Tanghalang Pilipino and the Writers’ Bloc, Inc. in cooperation with the National Commission for Culture and the Arts. Now on its seventh year, the Virgin Labfest has earned a solid reputation for its exciting and provocative line-up of one-act plays from playwrights both young and old. This year’s plays include KINAUMAGAHAN by Rachelle Rodriguez and Wennielyn Fajilan, REQUIEM by Juan Ekis, KAFATIRAN by Dingdong Novenario, ISANG GABI BAGO MAGBUKAS ANG PORTRAIT OF AN ARTIST AS A FILIPINO NI NICK JOAQUIN the first featured full-length play by Carlo Pacolor Garcia, STREETLIGHT MANIFESTO by Mixkaela Villalon, KAWALA by Rae Red, EVENING AT THE OPERA by Floy Quintos, MGA LOBO TULAD NG BUWAN by Pat Valera; BAWAL TUMAWID, NAKAMAMATAY by Joey Paras, and THE VALLEY MISSION CARE by Russell Legaspi. 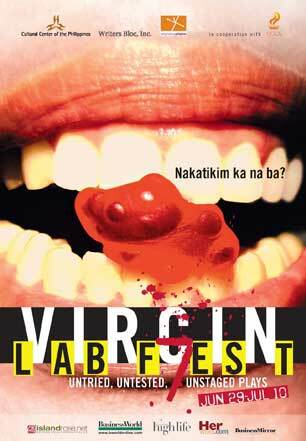 Plays from the previous Virgin Labfest will also be restaged. They are HIGIT PA DITO by Allan Lopez, ONDOY by Remi Velasco, and BALUNBALUNAN, BINGIBINGIHAN by Debbie Ann Tan. Directors tapped to handle the plays include Riki Benedicto, Juan Ekis, JK Anicoche, Paul Santiago, Ed Lacson Jr., Paolo O’Hara, Jomari Jose, Pat Valera, Joey Paras, Missy Maramara, Tuxqs Rutaquio, Issa Lopez, Dennis Marasigan, Jose Estrella and Allison Segarra. Likewise, there will be readings of plays, among them, CHIAROSCURO by Lito Casaje, HOUSE OF CANDLES by Nick Pichay and HERMANO PULI by Layeta Bucoy. Open-forum will be held after each performance. Fragments, site specific excerpts, shall be staged by the Sipat Lawin Ensemble featuring new plays by Krista Ann Taclan and Lito Casaje. For further inquiries, please call the CCP Dramatic Arts Division at 832-1125 locals 1606 to 1607.